I often roast a whole chicken and eat it throughout my busy week. 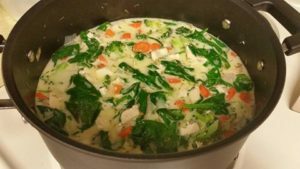 I save the breast meat for soup, and then use the carcass to make homemade bone broth, which is wonderful in this soup. Store-bought works just as well, just try to use organic, free-range broth. After chopping the veggies, I put the scraps into the broth as well. Nothing to waste, and it makes a very flavorful, healing bone broth that I also enjoy drinking in my mug. I have included one AIP adjustment. Some key staples in the AIP protocol are bone broth and lots of veggies. This is a delicious way to incorporate both! You can also make the soup without the coconut milk. Either way it tastes great! I like the coconut milk, as it makes it more filling and a satisfying meal. Plus, it’s a great source of good fat in your diet! I stress to my clients to experiment with cooking. Try different things, find the flavors you love to combine. Feel free to change some veggies, and even the protein. Have fun with your cooking, and most of all, enjoy the smell, textures and flavors that make a meal so wonderful! Cut up all chicken meat into chunks and put aside in a bowl. Put on the onion goggles (for real—they save your eyes! Amazon has them in all colors and prices!) and dice the onion. I prefer yellow sweet onion. Add to hot oil in pot, cook about 5-8 minutes, until onion is translucent. Add minced garlic for about 1 minute, until fragrant. Add the carrots, sea salt, pepper (if not AIP.) This is when I’m chopping the broccoli. If you’ve already cut the broccoli, cook the carrots for approximately 5 minutes. Add the chicken broth. Bring mixture to a boil, reduce heat to medium low, cover, and simmer 10 minutes, until the carrots reach a slightly tender texture. Add the broccoli, chicken, thyme, tarragon, and coconut milk. Let simmer a few minutes, taste to see if more herbs/spice needed. Continue simmering for 5-8 mins. Add container of spinach, stir in and turn on low, cover. It will look like a lot of spinach, but trust me, it wilts to nearly nothing! Voila! Adjust seasonings as needed, and enjoy!